Sheila Yonemoto teaches Qigong classes to the surrounding Alhambra, South Pasadena, Pasadena, San Marino, San Gabriel, and Los Angeles communities. Qigong (also called Chigong, Qigong, or Chi Kung) is a natural pain relief therapy that originated in China 5,000 years ago. Qigong can offer relief for ailments such as back, lower back, and joint pain, as well as pain associated with arthritis and sciatica, among others. Qigong exercises also relieve stress and fatigue and generally give a sense of improved energy and well-being. The Qigong classes are taught by Sheila Yonemoto, who has studied with Master David Dajiang Yao. Master Yao has over 45 years of experience in Qigong and has taught classes at Cal Tech UCLA, Cal Arts Institute and at several aerospace companies. He has several masters degrees, including a degree in mechanical engineeering. He has used his scientific training to streamline the training of Qigong so that benefits such as pain and stress relief can be attained quickly. Master Yao’s style of qigong exercises are well suited to Westerners as they get fast results and are easy to practice. Master Yao has taught over 300 students in the United States. 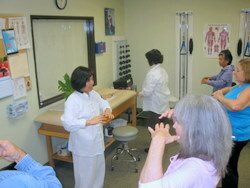 Sheila Yonemoto gives Qigong seminars in Alhambra, CA (near South Pasadena). See our blog and try your first Qigong class for FREE.